Alicia Arquera, a member of the International Socialist Group, gave this Introduction to a discussion on Women and Independence at the Edinburgh branch of the Radical Independence Campaign on April 29th. I just wanted to start by saying that I am pleased I am to have been asked to speak this evening on women and independence. 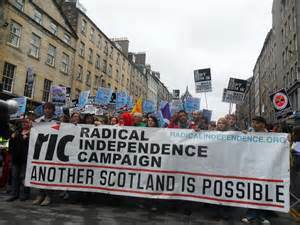 I’ve been involved in the radical independence campaign since the conference of last year, and during that time I’ve felt slightly disheartened by the lack of discussion of issues that face women and the role of women in the campaign. Little discussion has been had on what a radical vision for Scotland could do for women’s liberation. But hopefully this evening we will outline some of the issues that need to be considered when thinking of a progressive Scotland. My name is Alicia Arquera and I work as a support worker for women in the criminal justice system. I am not going to sit here and say that I am speaking for all women. I recognize that my reality is a different reality to a woman that is sitting in a three bedroomed council house in Craigmillar worrying about the bedroom tax, or a woman that is accepting minimum wage working as a care assistant in Leith. This article on the ‘Bedroom Tax’ in Northern Ireland comes from eirigi. 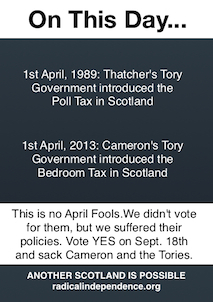 Several parallels (some erroneous and some useful) have been drawn between the ‘Bedroom Tax’ and the Poll Tax. However, even Thatcher’s Tory government never tried to introduce the Poll Tax into Northern Ireland in the context of the Republican struggle there. Today, the UK government feels more confident. This only re-emphasises a most important feature of the successful Anti-Poll Tax campaign – the necessity to organise on an ‘internationalism from below’ basis. 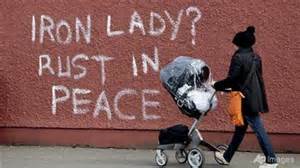 Fond memories of Thatcher on the Falls Road – where at least there was no Poll Tax! Next month, as Stormont starts to debate the Welfare Reform Bill, thousands of families in Housing Executive homes or renting from housing associations in the Six Counties face the bleak prospect of losing a substantial portion of their housing benefit if their home is deemed to be “under-occupied”, with only one bedroom allowed for each couple or individual over 16. More than 32,000 households stand to be affected by this ‘bedroom tax’. Contrary to the impression being created by proponents of this scheme, the vast majority of the homes affected are “under-occupied” by just one bedroom. The Six Counties already faces a growing housing crisis with almost 35,000 applicants on the social housing waiting list. David Jamieson of the International Socialist Group has replied to two contributions made by Allan Armstrong of the Republican Communist Network (see http://republicancommunist.org/blog/2013/01/23/david-jamieson-of-the-the-isg-replies-to-allan-armstrong/). 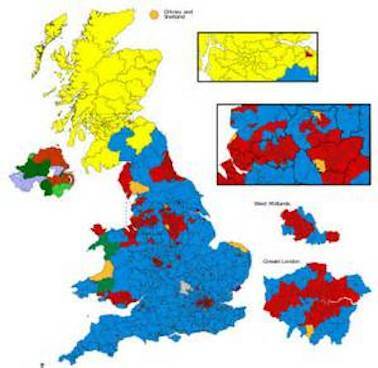 These took a critical look at ISG member, James Foley’s pamphlet, Britain Must Break, and examined the prospects for the Radical Independence Campaign, and the role of the ISG within it, following from the successful conference held last November 24th in Glasgow. The RCN very much welcomes the ISG’s preparedness to enter into such debates in a considered and fraternal manner. There are a number of elements to David’s reply, which will be dealt with separately. However, the most immediate difference arises over how the RIC should organise. Once some of David’s misunderstandings about what the RCN proposes are cleared up, then it may be possible to agree on the democratic form of organisation we all require. This could help the ISG, RCN and other participants move the RIC forwards to a higher political synthesis, using people’s varied contributions and experiences. In doing so, the RIC would break with the sectarianism and opportunism which has characterised so much of the Left’s practice up until now. The current crisis in the SWP highlights the necessity for this.